All cemeteries to be mapped and placed in computerized database. Stone markers will be placed at corners of about 1,400 cemeteries. The Polish government will place border markers in some 1,400 Jewish cemeteries in Poland. 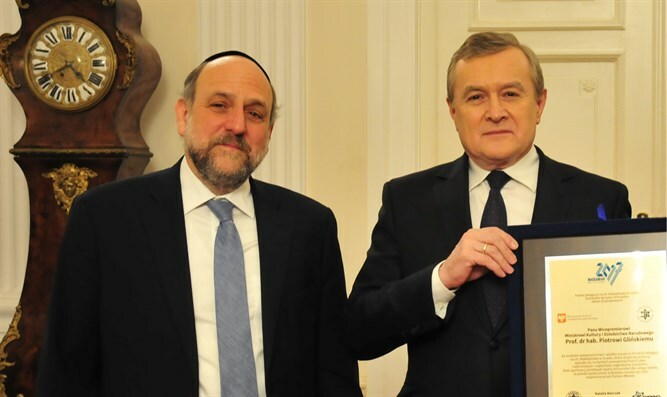 This was agreed upon between Polish Culture Minister Piotr Gliński and Poland's Chief Rabbi and Standing Committee of the Conference of European Rabbis member Rabbi Mordechai Schudrich. According to the agreement, all the cemeteries will be mapped and placed in a database that will be available to the public, and border markers will be placed at all the cemeteries' corners. Rabbi Schudrich said that about 200 out of the approximately 1,400 Jewish cemeteries in Poland are fenced, but that markers should be erected as many fences have begun to crumble. According to Schudrich, hundreds of cemeteries have already been mapped and are in the computerized database of the European Union Conference of the Rabbis of Europe and the Claims Conference. Mapping additional cemeteries will be carried out by Antiquities Authority staff at the Culture Ministry through local authorities and international databases. Using a bar code placed on the memorial stones, visitors will be able to learn about the history of the place and the cemetery, the mapping, the boundaries, and the personalities that are buried there.